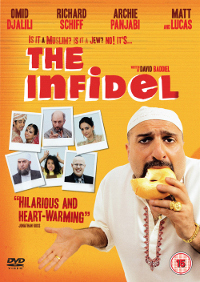 Last year we blogged about a funny film called The Infidel, written by David Baddiel, a Pakistani Jew, and which starred Iranian Baha'i standup comic Omid Djalili and West Wing veteran Richard Schiff. Now it appears that NBC is developing a sitcom series based on the film. The Infidel sets up the improbable scenario of a Muslim taxi driver who discovers he was adopted and is actually Jewish. As you can imagine, many funny situations develop as the film explores cultural differences and similarities between Jews and Muslims. The message is that mutual tolerance can be achieved, but the road is sometimes confrontational, hazardous, unpredictable, and in this case, also funny. For Djalili, headlining his own NBC series projects has been a decade in the making. The network first signed a talent holding deal with Djalili in 2002 following his standout performance at that year’s Edinburgh festival with a stand-up routine that revolved around his Middle Eastern ancestry and what that entails in the post-Sept. 11 world, as well as a self-deprecating look at the collision of his Iranian and Western cultural identities. At the time, then-NBC head of casting Marc Hirschfeld described Djalili to me as “the best comic that you don’t know, a character actor who is like a bigger-than-life John Goodman, a big lovable guy.” For Djalili’s starring vehicle at NBC, he and Annabel Knight, his wife and writing partner, came up with the idea of him playing an Iranian professor in New York who ends up helping his brother at his diner. The pilot script was barely finished when the U.S. invaded Iraq. The network told the comedian that America was probably not ready for an Iranian sitcom lead at that particular moment. Djalili went on to be cast in Whoopi Goldberg’s short-lived NBC comedy series Whoopi, and earlier this year, he appeared in his second American series, also on NBC, the ill-fated Paul Reiser Show. When I interviewed Djalili in 2003, he was realistic about the challenges his ethnic background presented for a TV career in the U.S. “It’s an uphill battle for me, you know,” said the actor, whose feature credits include the blockbuster The Mummy and Pirates Of The Caribbean franchises. “Like when Mr. Cunningham in Happy Days walks on the set and they go ‘Whoo!’ That’s not gonna happen for a long time.” Eight years later, it may. In the following video, Baddiel and Djalili talk about the film and their experience in making it. I am truly looking forward to this, as I know it will not only entertain, but hopefully serve as a bridge! Good work,Al....Thanks! M.A.